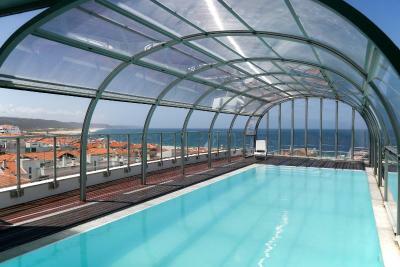 Lock in a great price for Hotel Praia – rated 8.2 by recent guests! The location was perfect, a two minute walk to the beach, shopping, and excellent restaurants, is hard to beat. The room was very clean, spacious and best of all, the air conditioning worked. The rooftop pool and bar area was a perfect place to watch the sunset! great location, super tight/affordable parking, most staff were very nice except for the one who seemed to be the matriarch of the front desk, $187/night, if u needed anything from the bar, you had to ask front desk, , the pool bar closes at 10(amazing view & the sun sets at 10p.m. in summer, why close???? 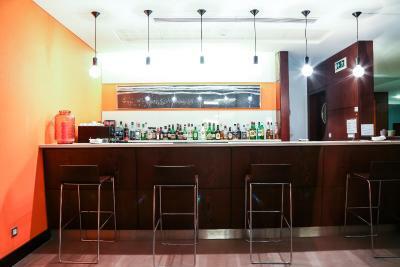 ), but if you want anything there, there is no one attending the bar, you have to call or go downstairs like we did. 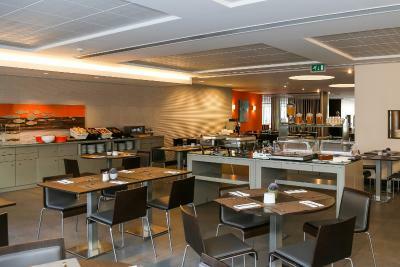 Great size room & very clean, great breakfast selection. The hotel is well situated to the beach. The staff were willing to help answer questions as well as help finding information about travel. I was a bit disappointed in the quality of breakfast and my room had a bit of a funny smell. Otherwise very comfy bed and stay. Great room. Very clean. Excellent breakfast. Advice to have dinner at Mar Bravo was excellent. Our junior suite wirh balcony was fantastic. 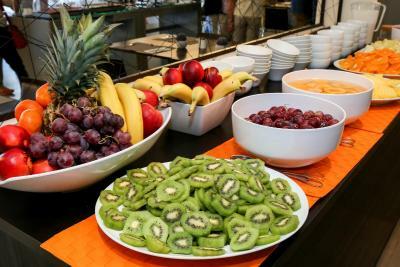 The hotel is well run, breakfast buffet was so generous and varied, something for everyone. The staff were extremely helpful. Sofia was really helpful and kind. My fell ill on a Saturaday night and she helped me find an open pharmacy and gave me what she had to help. 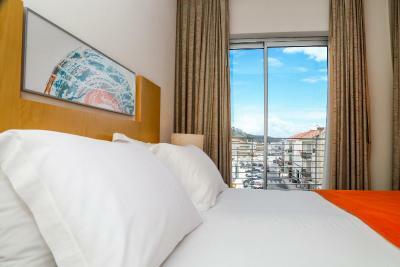 The room was immaculately clean and a very good temperature.The sheets were super soft and clean. The bath was huge and the shower had great water pressure. The balcony comfortably fit two and had a great view of the funicular. The carpark was a bonus because parking on the street is difficult to find. The hotel is very close to the beach and the restaurants. It was near the beach , the restaurants , mercado,, bars. spacious room (the biggest we encountered in this vacation in portugal, and we were in multiple places). 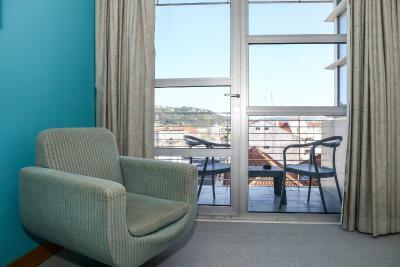 the room has a small balcony, big clean bath, TV with multiple english speaking channels, wifi (after spending some days in a place with no wifi and only portuguese TV, this was a nice change) I loved the breakfast, because they had many fruits. (and also other stuff like eggs, meat, cereals,..). one warning - the coffee from the machine is really bad (imo). but we asked for espresso, and it was very good. 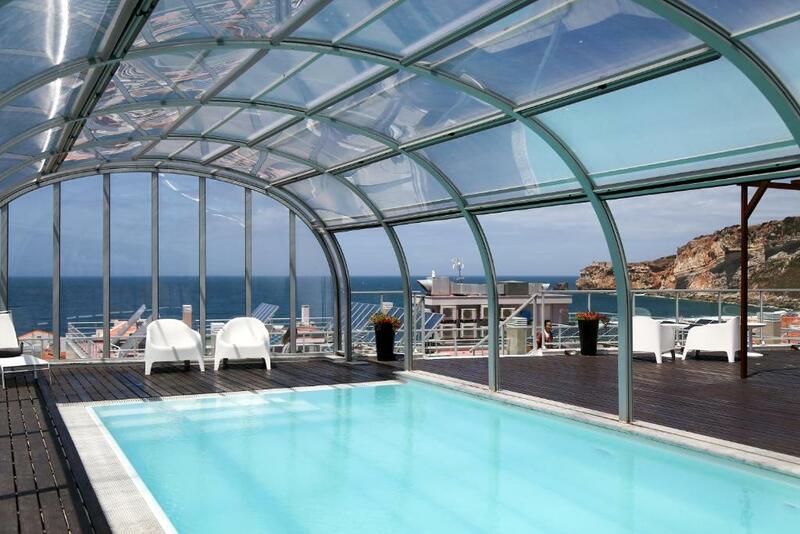 Hotel Praia This rating is a reflection of how the property compares to the industry standard when it comes to price, facilities and services available. It's based on a self-evaluation by the property. Use this rating to help choose your stay! 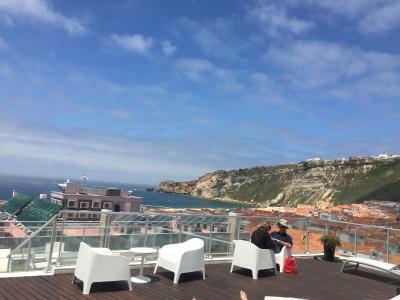 One of our top picks in Nazaré.Located in the center of town, the 4-star Hotel Praia in historic Nazaré offers a rooftop covered pool with panoramic sea view and spacious air-conditioned rooms with a balcony. 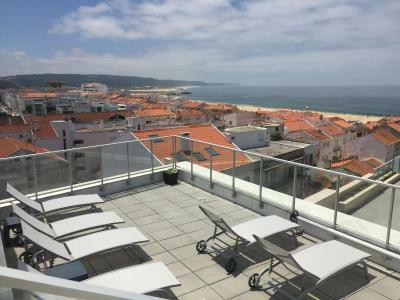 Nazaré Beach is just 150 feet away. 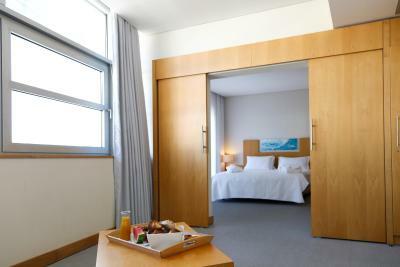 Hotel Praia’s soundproofed rooms are equipped with a flat-screen TV and a desk. 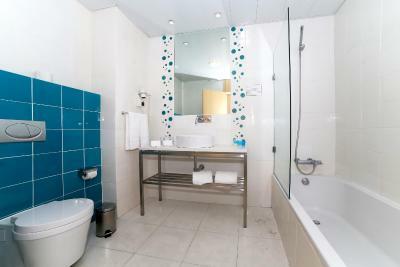 The colorful private bathrooms come with the hotel’s own bath products. Family rooms come with a kitchenette where guests can prepare light meals. Praia’s bar serves cocktails, which can be savored on the sea-facing terrace. 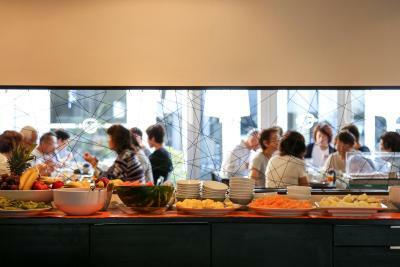 Breakfast can be enjoyed in the room, upon request. 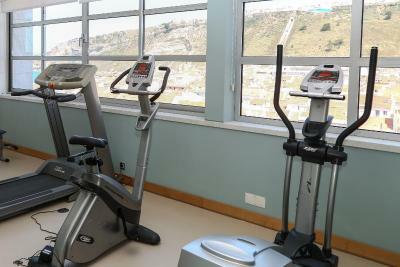 Guests can work out at the modern on-site gym. The famous giant wave viewing spot of São Miguel Arcanjo Fort and its lighthouse are located 1.9 mi away and Batalha Monastery is just a 10-minute drive from the hotel. 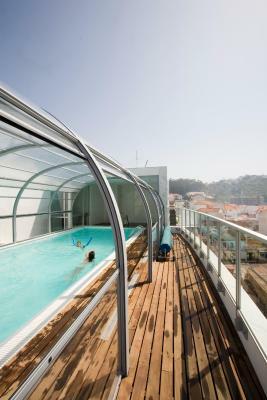 When would you like to stay at Hotel Praia? 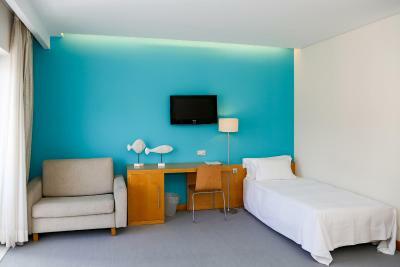 This air-conditioned double or twin room features a flat-screen TV, a desk and a private bathroom with free toiletries. 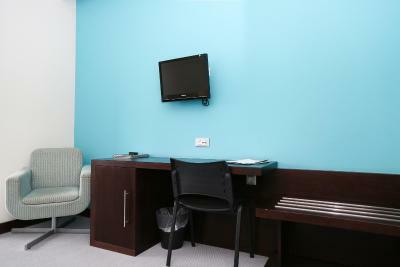 This air-conditioned junior suite features a living area, a flat-screen TV, a desk and a private bathroom with free toiletries. It has capacity for one extra bed. 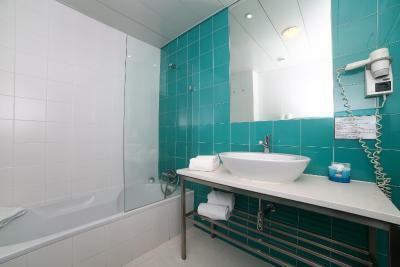 This air-conditioned suite features a separate living area, a flat-screen TV, a desk and a private bathroom with free toiletries. This air-conditioned duplex room features a living area, a kitchenette, a flat-screen TV, a desk and a private bathroom with free toiletries. 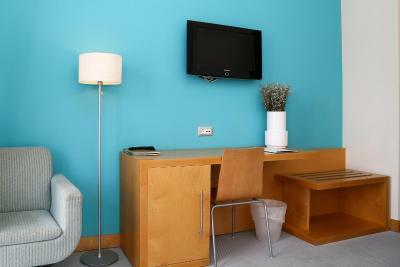 This air-conditioned double room features a flat-screen TV, a desk and a private bathroom with free toiletries. 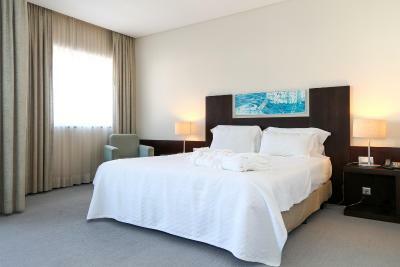 This air-conditioned double or twin room features side sea views, a flat-screen TV, a desk and a private bathroom with free toiletries. 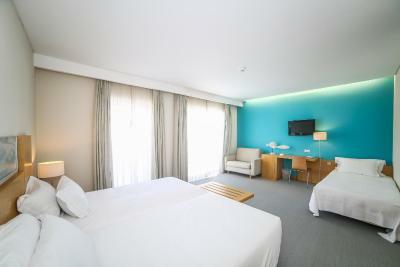 This air-conditioned triple room features a flat-screen TV, a desk and a private bathroom with free toiletries. 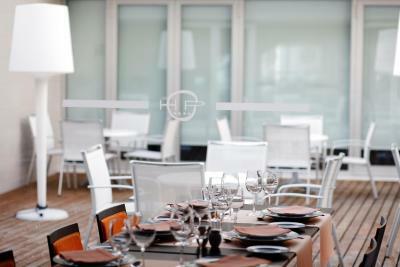 House Rules Hotel Praia takes special requests – add in the next step! Hotel Praia accepts these cards and reserves the right to temporarily hold an amount prior to arrival. Please note that to use the swimming pool it is mandatory to wear a swim cap. At an extra cost of EUR 4.50 each, swim caps are available on site. 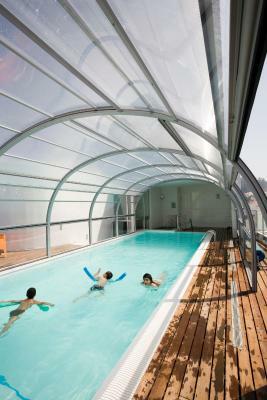 Please note that the Hot Tub will be unavailable until further notice, due to renovation works. The swimming pool is too small to swim, but jogging. 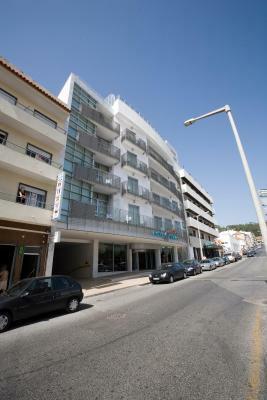 Located centrally in the town, with a few minutes of walking to most occasions, bus station, restaurants and beach. 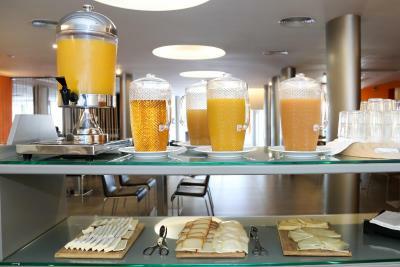 The breakfast is value for the room rate. 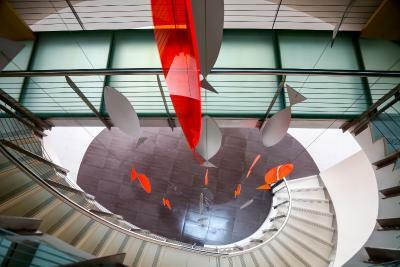 Staff were excellent and very helpful. 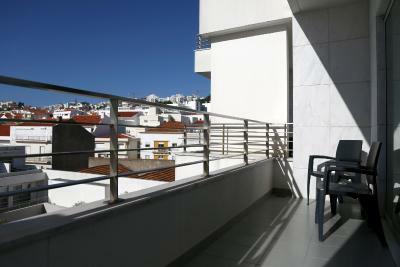 Great location near the beach and the town centre. 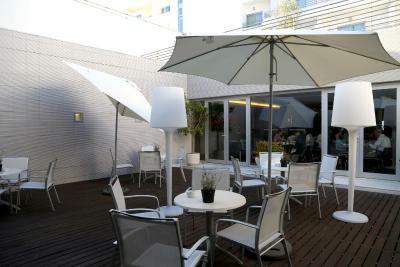 good breakfast, great location just 2 minutes from the beach. Both ladies in reception that we’ve met, were not polite, helpless and untidy. The sink was leaking, the room was not very clean. Breakfast set up and environment in general clearly shows that it’s the place just to make money, no care, no love in it. Reception behaved as we own them something. 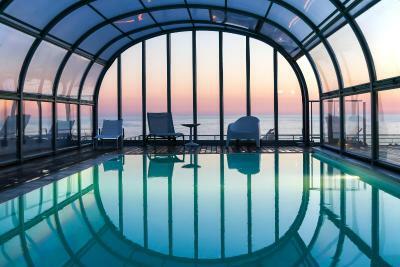 There are so many beautiful places to stay in Portugal, we highly recommend to choose another hotel. The location is amazing, 2 minutes from the beach. The stuff are very pleasant and hospitality. Cleaning service on the high level. TV should be larger in the rooms. Pool hours should be more accessible, like 6-8. For sure gym hours need to accessible, same as pool hours, like 6-8. 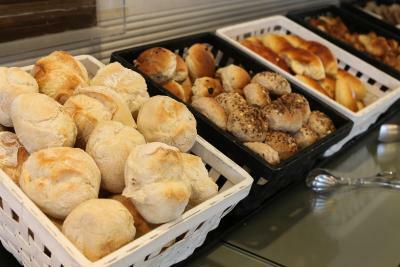 Pastries during breakfast should be more a variety, not the same every day. Maybe offer restaurant vouchers. 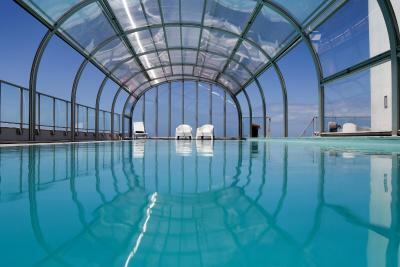 Swimming pool is a joke, don't believe nice pictures, it's tiny, no view cause glass is always weeping, place around is for 3 chaise lounge maximum. When we were there one of underwater lamps just got out of the socket and started floating around. Pool is half covered with mold. Plus you have to use cap (which they forgot to mention at check in and we had to run around hotel in our swimming clothes). Cap from hotel is 4.5 eur, no bath robes in the room. Also guy at check in wasn't very polite, to my question why we got twin room even though monthes in advance i requested double, he said literally this: "u know, there're people who stay longer, so they have a priority and we gave them all better rooms". (well, it's obvious, but in my mind it shouldn't be said directly to guests in this manner). And view from our room was to the roof and ventilation system - so avoid rooms on 1 floor - half of them have this. Comfortable bed, clean rooms, very good breakfast. The Bed (Since we reserved a double one but we’ve provided with two attached twin bed. The location. The view. The Breakfast. The pool. Bathroom easily floods and wifi is very poor (at least in my room). Location was perfect. Room had a very good size.